On 5 September 2008, ESA's Rosetta comet chaser completed its first encounter with a main belt asteroid when it flew past a small piece of space debris known as (2867) Steins. Following analysis of the images returned by Rosetta's OSIRIS cameras, a number of distinct surface features were identified and named. As is the case with the official place names given to all worlds in the Solar System, there is a specific theme for the Steins nomenclature. Since the asteroid's shape bears some resemblance to a multifaceted jewel, the International Astronomical Union (IAU) accepted a proposal from the OSIRIS imaging team that craters on Steins be named after gemstones. The process of naming major features on the surface of Steins was initiated by Sebastien Besse, at the time a PhD student working with the OSIRIS imaging team in France, now a Research Fellow at ESA-ESTEC. During his studies of the craters on Steins, he began to think about a suitable nomenclature for them. Since Steins looks very much like a diamond in the sky, he decided to research the names of different gemstones, with a view to linking them to particular craters. One of the factors influencing his deliberations was a desire to select names that would be familiar or appealing to the general public, and relatively easy to pronounce. After discussions with the rest of the team, it was agreed that the names of 23 gemstones or precious minerals would be recommended to the IAU. At the same time, it was decided to follow tradition by naming a large region after the asteroid's discoverer, Nikolai Chernykh, who discovered Steins in 1969. Although the name 'Ruby' was rejected as unsuitable and replaced by 'Diamond', most of the names were officially accepted in May 2012. Approximately 60 per cent of the surface of Steins was resolved during the Rosetta flyby. The most detailed images were obtained by the OSIRIS Narrow Angle Camera (NAC) during the inward leg of the encounter. Unfortunately, the NAC stopped its automatic observations at a distance of 5200 km from the asteroid, 10 minutes before closest approach. As a result, the highest resolution images of Steins – about 80 m per pixel - were actually taken by the OSIRIS Wide Angle Camera around the time of closest approach, at a distance of about 800 km. Steins was found to be a small remnant of a much larger asteroid, with dimensions of 6.67 km × 5.81 km × 4.47 km. It rotates in a retrograde (east-west) direction, so its south pole is located at the top of the Rosetta images. The axis of rotation is roughly perpendicular to the plane of its orbit, enabling the spacecraft to fly right over the asteroid's equator. Compared with other asteroids imaged at close quarters by spacecraft, Steins has a low crater density. Nearly all of these are shallow indentations. The overall crater shape and depth-to-diameter ratio are consistent with degradation caused by blanketing from impact ejecta and disturbance of loose regolith by seismic shaking during large impacts. 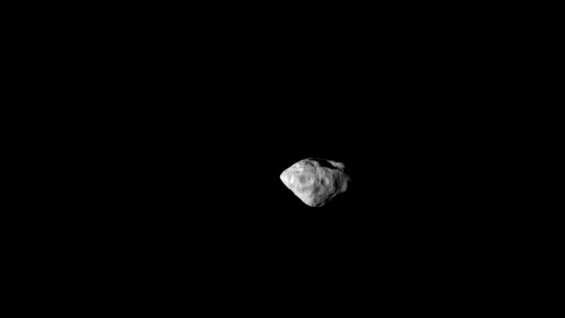 Asteroid Steins as viewed by OSIRIS during the flyby of 5 September 2008. About 40 craters have been identified, but only the most prominent of them have been given names. The dominant landform is an impact feature near the south pole – now known as Diamond crater – which measures 2.1 km in diameter and 300 m deep. The relatively large size and depth of this crater compared with the asteroid itself indicates that Steins was probably shattered by the force of the collision, so it is now a pile of rubble rather than solid rock. A circular crater imaged in the centre of the asteroid during closest approach is called Topaz. It is about 650 m wide and 80 m deep. Another noticeable feature is a catena, a chain of pits (or crater-like indentations) that stretches from the asteroid's north pole (the pointed area at the bottom of the images) all the way to Diamond crater. This feature may be linked to the shattering impact that created Diamond crater at the south pole. At least some of the craters in the chain may have been formed by loose material sinking into a subsurface fracture. These were named after familiar gemstones such as Agate, Opal and Jade. However, Sebastien Besse also decided to include Citrine, since it sounds like the French word for lemon: citron. Another elongated feature (a groove or fault), surrounded by small pits and craters, is visible on the other side of Steins, approximately opposite to the catena. This feature has yet to be named. The striking conical appearance of Steins is associated with an equatorial bulge and a relatively smooth northern hemisphere. This may be the result of the so-called Yarkovsky-O'Keefe-Radzievskii-Paddack (YORP) effect: when more heat escapes from one side of a small object than the other, its rate of rotation will change. As the asteroid's spin rate slowly increased, loose material may have slid toward the equator, erasing many of the smaller craters and creating its distinctive conical shape. The current rotation period of Steins is a little over six hours.